Public spending cuts, while on the rise worldwide, are bad for the U.S. economy. U.S. states provide a good illustration of this principle. Since the start of the Great Recession 20 states have cut public spending while 30 states expanded spending. Those that cut spending have fared worse economically than those that expanded spending. 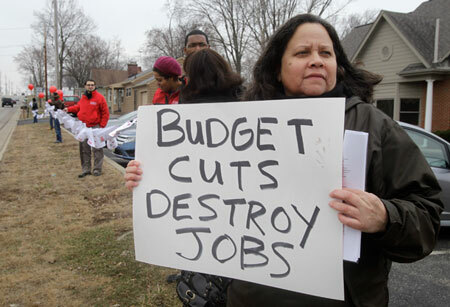 Lost private-sector jobs are only two-thirds the rate of the average spending cut state. The economy is growing 2.6 percentage points faster than before the recession. This column digs deeper into these numbers to see why slashing public spending makes a fragile economy worse. 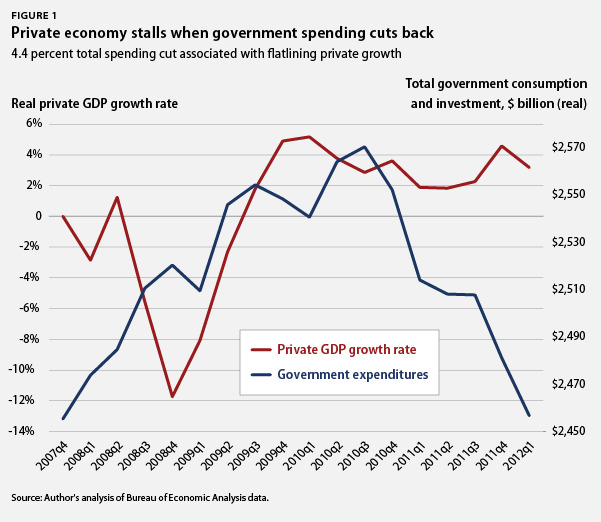 We argue that a strong and sustained economic recovery hinges on government investment. Governments around the world are zealously pursuing public-spending cuts. They believe that fiscal austerity is a cure for their increasingly fragile home economies. But economists have long known that when an economy turns south, public spending on investments and services can make all the difference between robust recovery and prolonged stagnation. A fragile economy can be buttressed and boosted by increased public spending on investments like education, infrastructure, energy efficiency, and putting money in people’s pockets through safety-net programs like unemployment insurance and Medicaid. The government—like families and businesses—also buys a tremendous volume of goods and services from the private market. As businesses see more sales and potential customers, they will have confidence in the economy to add jobs and crank up the economy’s private-sector engine. Dramatically cutting spending in a fragile economy, however, can pull the rug out from nascent economic growth, as we are seeing now here in the United States and around the world. The economics of this fact have not changed, but the politics have. And Americans are worse off for it. As the U.S. economy plunged into recession throughout 2008 and early 2009, government expenditures at all levels expanded to offset and buttress the falling private-sector economy. (see Figure 1) From the fourth quarter of 2007 through mid-2010, government expenditures increased by 4 percent after adjusting for inflation. The increased government spending helped reverse the double-digit contraction in the private economy caused by the real estate bubble collapse and ensuing financial crisis. By late 2009 increased public spending had helped restore the private sector to sustained positive economic growth. Private-sector employment, which had been shrinking at 839,000 jobs per month in January 2009, was again adding net new jobs by March 2010. But in the second half of 2010, combined government spending in the U.S. contracted sharply—from $2.6 trillion down to $2.5 trillion in the fourth quarter of 2011, a 4.4 percent cut. The private economy felt the impact in short order. Private-sector growth fell from more than 5 percent in early 2010 to less than 2 percent by the second quarter of 2011. Private growth strengthened to an extent in late 2011 after uncertainty subsided over whether conservatives in Congress would push the U.S. government to default on its debts. But private-sector growth is slowing again as government withdraws its support for services and investment that provide a foundation for private economic activity. Most of the expenditure cuts in the United States can be traced to state and local governments, where balanced budget rules and so-called “taxpayer bills of rights” limiting public-expenditure increases both constrain state governments’ abilities to pursue economic policies to counteract the effects of downturns and return affected economies to stronger footing. The fiscal crunch occurs at a time when state and local services are most needed to help families and businesses weather the economic storm. Because it is more difficult for states to adjust their fiscal positions, Congress routinely makes aid to state and local governments a key component of measures to strengthen the economy during a downturn. This aid remains one of the policies with the biggest bang for the buck in countering a weak economy. Relieving the fiscal strain on state and local governments should be part of the policy mix if Congress is able to overcome conservative obstruction to growth-enhancing public expenditures. Constraints on their budgets do not fate state governments to spending cuts, as the analysis below shows. By drawing on “rainy day funds,” expanding expenditures on the state capital budget for big-ticket public investments, and shifting tax burdens away from middle-class and low-income families onto those more able to pay, states can increase expenditures and are seeing remarkably different consequences than states that cut. To see how state spending affects economic outcomes, we divided U.S. states into two groups based on whether they had expanded or contracted public spending since the start of the Great Recession in December 2007, adjusted for inflation. 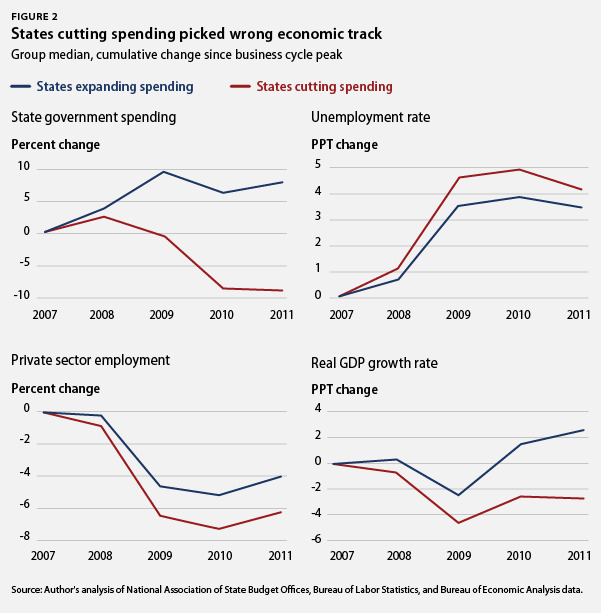 Figure 2 shows the different economic trajectories of states cutting spending and states expanding spending. The lines plot the median of each group of states—the point where half of states are higher and half are lower—for each economic indicator. The median measures the average tendency of the state groups, but unlike the simple arithmetic average (or mean) it is not skewed by extreme outlying cases such as North Dakota, where a recent fossil-fuel boom has set it apart from the national economy, or Florida, which is suffering one of the worst real-estate hangovers. Overall, states cutting spending cut expenditures on public services and investments by an average of 9.1 percent over the course of the recession and recovery, from 2007 through 2011. States that expanded expenditures did so by an average of 8 percent. Now we examine how these choices affected the states’ unemployment, private-sector jobs, and economic growth. These states showed perhaps the greatest divergence on economic growth. Expanding states accelerated well ahead of their prerecession growth rates while cutting states languished with growth much slower than before the recession. 4.6 percentage points below their prerecession level. Coming out of the depths of the recession, states that increased spending accelerated and pulled away from expenditure-cutting states. Recovery in the expenditure-cutting states improved in 2010 but then stagnated in 2011, still growing on average at a rate 2.7 percentage points slower than prior to the recession. In contrast, expenditure-expanding states sped up to surpass their prerecession growth rates. In 2011 they were growing on average 2.6 percentage points faster than they were before the recession. Though both expenditure-cutting and expenditure-expanding states saw dramatic rises in unemployment rates, Figure 2 shows that on average states cutting expenditures fared substantially worse, with unemployment rates rising faster and higher than in states expanding expenditures. On an annual basis, expenditure-cutting states saw unemployment rates increase by 4.9 percentage points over prerecession levels by 2010. In contrast, expenditure-expanding states saw more contained increases in unemployment, with unemployment rates rising on average by 3.8 percentage points. As the economy improved in 2011, both expenditure-cutting and expenditure-expanding states saw unemployment rates fall relative to the start of the recession. But by the close of 2011, unemployment in cutting states stood an average 4.1 percentage points above the pre-recession level. Unemployment remained only 3.5 percentage points above prerecession levels for expenditure-expanding states. Expenditure-expanding states’ better employment picture was not due to padding public payrolls with government spending. Their increased spending on public services and investments delivered a palpable boost to the private sector that helped private employment better weather the economic storm, as seen in Figure 2. Private employment in states that cut spending fell faster on average and further than states that increased spending. By 2010 private-sector employment in expenditure-cutting states fell more than 7 percent below its prerecession level, while expenditure-expanding states’ private employment fell by only 5 percent. As the national economic recovery took hold, private employment recovered faster in expenditure-expanding states than in cutting states. By 2011 the rate of private job losses in cutting states was 50 percent larger than that in expanding states, relative to their prerecession private employment levels. No laws of man or nature say that policymakers must cut spending. Even before President Barack Obama and the American Recovery and Reinvestment Act of 2009, U.S. policymakers met the recession and financial crisis with an additional $65 billion, or 3 percent, of fiscal support. The politics of public expenditures may have changed since then, but the economics has not. Nor has the situation faced by millions of unemployed workers and financially stressed middle-class families still waiting for the economic recovery that policymakers can deliver with expanded fiscal policy. Unemployment rates: U.S. Bureau of Labor Statistics, “Current Population Survey,” multiple years. Private employment: U.S. Bureau of Labor Statistics, “Current Establishment Survey,” multiple years. Real state gross domestic product: U.S. Bureau of Economic Analysis, “Regional Data, GDP & Personal Income Accounts,” multiple years. Adam Hersh is an Economist at the Center for American Progress.